Imagine that you have been asked to create your very own airline. What would you call it? Design a simple logo for your airline and post it on your blog. You must include a short explanation of your logo below the picture. 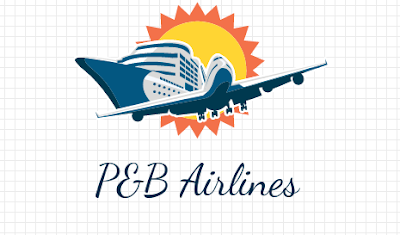 The 'P&B Airlines' mean Plane & Boat Airlines. You can go in a boat or a plan, it's your choice. The plan travels where ever you want. The boat also travels where ever want, it comes in a 'Cruise ship'. I really like the idea of having a joint company like this, especially in New Zealand - I often see the cruise ships come into port at the viaduct. Do you think your planes and boats would be quite luxurious? This is a great idea! No one involved in the Summer Learning Journey programme has yet to create a combination airline-boating company. Genius! You have done a very nice job of using your creativity to produce a unique idea, a unique logo and a unique name. Way to go, Francesca. I love it! Keep up the great work. I'm already looking forward to reading your blogs as we move into a brand new year. Wishing you and your family a very Happy New Years! I agree with this whole idea of a combination plane and boating company. It sounds like you'd at least make a good travel agent, if not an entrepreneur or CEO. Keep up the thinking that created this idea, you see a need, you fill a need. You have an idea that doesn't exist, you check out if people will like it, and then roll with it. It's excellent market practice. I really enjoyed reading your piece of writing,I thought it was really creative by travelling by boat or Plane,I thought that was really interesting! !.Maybe next time try to add more information to make your piece of writing more amazing maybe?